Yellow Mellow! : New Photo: Marvel's Thor! theaters on May 6th, 2011 in 3D! 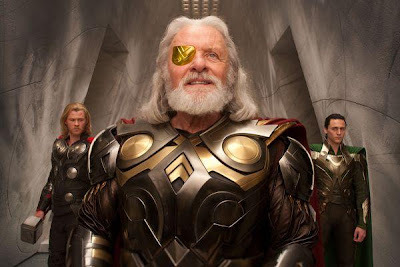 Sir Anthony Hopkins looks pretty good as All Father Odin. Looks the part, except perhaps that the armor looks a bit plastic. I'm not surprised that "Thor" will be in 3D though 2D is just fine. I have just completed a new novella “Soldier of the Brell” which I will make available as an e-book download from the Xlibris site. I will also make it available on the IPAD, Amazon’s Kindle, the Sony Reader and other E-readers. Yup, he does looks good as Odin, father of both Thor and Loki. One thing that concern me is the futuristic look of the photo. And like you said, the armor looks like plastic. Can't wait for more new photos. By the way, will check out the link you provided here.